Rugby is an explosive, dynamic game that blends the most physically demanding of skills and attributes with some of the deftest, and brings it all together in a game with arguably the strongest element of teamwork of any of the major world sports. At the very top level of Rugby the players may still have incredible physiques that would dwarf your average person, but at amateur and youth level people of all shapes and sizes can play the sport. And it is incredibly easy to play, requiring little more than two teams, a ball and a playing area. It is not hard to see why Rugby is catching on so quickly in the developing world and our volunteers are at the frontline of this sports development; coaching groups of children and young adults who are rapidly developing a passion for the game. Rugby is a sport that develops young people in a unique way. Aside from the individual skills involved it provides a channel for a young person's natural aggression whilst at the same time teaching them respect for others - which is why it's commonly known as a game played by gentlemen. The inherent elements of teamwork in Rugby provide young people with a structure and an important position within a small group of people which has an important knock-on effect , within the wider society outside of the game. 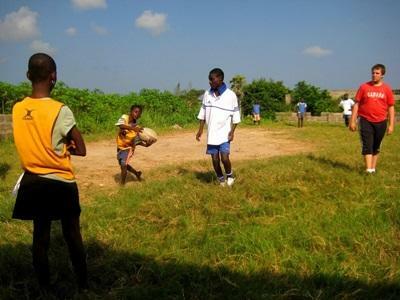 If you have a passion for Rugby then you could volunteer on one of our Rugby coaching projects in the developing world. You do not have to be an experienced player or coach to get involved; all you require is a good solid knowledge of the intricacies of the game, and a desire to impart this to others. You can volunteer on a Rugby coaching project on your gap year, career break or as part of an extended holiday. We at Projects Abroad strongly believe that sport can be used to develop individuals and communities and are working to introduce popular sports into new areas in order to achieve this. We cannot accomplish this without the help of our volunteers and this is why we need you to join our voluntary Rugby coaching projects. You will join a group who are dedicated to the sport and to passing on their love of the game to others. 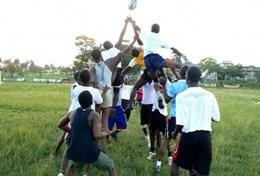 There is a lot to get involved in - ball-handling, line-out drills, fitness sessions and team tactics. Depending on your level of understanding about how the game works, you can help to develop and organise full training sessions with groups of young people and work on specific rugby disciplines. There is so much to get involved in and there is plenty of fun to be had at the same time!